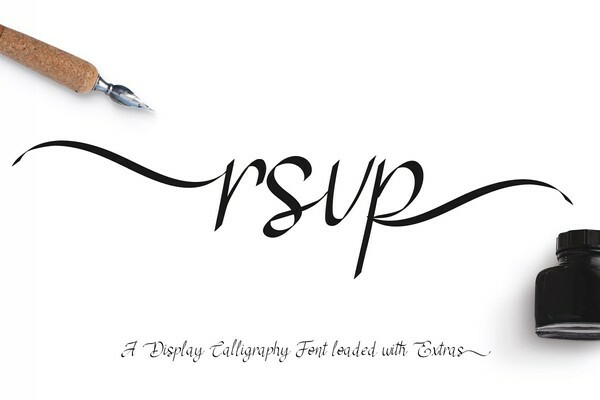 RSVP Display Calligraphy Font is an elegant display font loaded with swatches, ligatures, & stylistic alternatives. Created to go well on invitations, cards, & stationary with just a little bit of bounce and lots of style! The nib at 45 degrees give the traditional calligraphy feel, but it is modernized by new styles of letters and the extra swatches. Please note that the open type features can only be used in programs such as Adobe Photoshop and Indesign. A secondary swatch font with over 50 individual swishes, swirls, and icons. Multi- language support with the Western European diacritics. In the Character Map select the font you are using from the drop-down box. Ensure the Advanced box is checked. You will see the Character set appear, in these drop down boxes, go to ” Group by” and select ” Unicode Subrange. A second window will appear. In the new window scroll down to the bottom option and select ” Private use Characters” This will access your Glyphs in the Character Map window.